Discussion in 'Model S' started by Btr_ftw, Apr 1, 2017. After looking at article after article about Tesla fires, I'm starting to see a pattern here. They seem to mostly originate from the same place in the car. The front of the car... (duh) but more specifically the front drivers side. Full disclosure here. I have owned more than a couple Teslas and some of them were fire salvaged cars... and guess what? ALL of the fire car's I've owned the fire originated from the front of the car, specifically the drivers side. Ok no biggie. 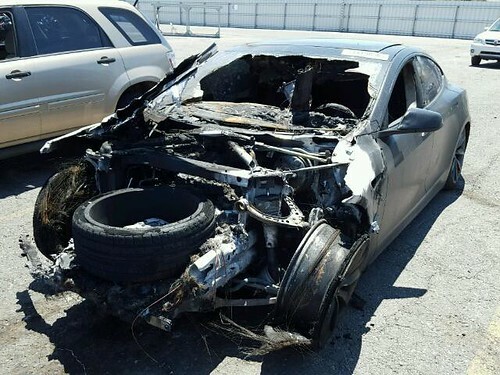 Then I see a new thread the other day about ANOTHER Model S that caught fire IN THE SAME LOCATION. I know that there is a high concentration of wiring harnesses up front along with the fuse boxes but something is up, why does it come from the front, and why the front driver's side? Something has to be going on here. I understand that my sample size is too small to make a conclusive answer, but given that Teslas don't catch fire very often I feel that I'm not too far off base. So lets analyze some Tesla fire trends shall we? No accident, no impact, happened while driving fire originated from front drivers side. France Fire, no accident, happened while driving, car made a loud noise. Fire started from front drivers side. I reallllllllllllly think there is something more here. Do we know what year these cars were manufactured? I'm wondering if this is something that Tesla has noticed and already fixed or if this is happening in recent builds as well. According to the article I read from the FB group, the last one fire investigators said started from the condenser for the BMS system. I'm assuming that means the fan for the left side HVAC condenser, since there isn't a separate heat pump for the BMS and radiators/condensers don't really seem like they can catch fire themselves. The last couple look to me like front LEFT, not front right. thats interesting, I wonder what they mean by that. the BMS is a circuit board that lives in the rear of the pack thats not cooled in any way. perhaps they mean the condenser for the the battery itself? but even that wouldn't make any sense. so do they mean that one of the condenser fans caught fire? I don't think I ever said right, did I? My apologies, you said "driver's side" and somehow my brain translated that to "right side". do they mean that one of the condenser fans caught fire? Another thought, which doesn't help much: I think it's a british investigator, and the english have sometimes used condenser to mean capacitor in electronics, which would seem like a suitable context here. But I don't think the BMS has large capacitors up front, and there is an HVAC condenser that is used as part of the battery thermal management right where they described. I initially translated condenser to capacitor. But re-reading I have to admit it's pretty vague. I'm curious too. If it's a fan or a motor of some sort it should be protected by a fuse. On that last photo, isn't the steering wheel on the opposite side of the fire damage (is that a UK license plate)? Are US and UK cars flips of each other under the hood parts wise? @Btr_ftw Guess none of these fires were battery fires? BMS condenser? Behind front bumper? Is that the condenser coils for the HVAC system which in turn provides thermal mgm't for the pack? In that thread they say it seems to have started between the wheel-well and the front bumper... there's not too much else there than the condenser coils and the accompanying fan. I have owned more than a couple Teslas and some of them were fire salvaged cars. Why do you buy fire salvaged Teslas? For the usable parts? This reminds me of Otmar's "Stretchla" project, where his donor car was damaged in that area and he spent some time digging in to it. Specifically his 2014 blog entries for March and April. In that area, there's the condenser coil fan motor, the motor controller, and some electric louvers controlled by a small motor, and not much else it would seem. Perhaps this is the reason we don't get to do more stuff remotely with the app... ? There is a distinct pattern, black & blue cars are prone to fires. Sorry, couldn't resist. Thanks for the interesting info. For what it's worth, when I exceed ~90 mph in my 2015 85D (typically when passing) I get a burnt toast like smell. These speed bursts last maybe 10 seconds max and the smell lingers for about 30 seconds. Consequently I'm wary of attempting a max speed run in this vehicle. No matter, it's the whiplash acceleration that I like. Has anyone else experienced this smell? I've been wondering about these "parked fires" too. Partly because my last service (third year on a April/May 2014 build) had job number one as an item that I hadn't requested repair/service for and isn't part of the regular regimen. It could be in a completely different part of the car (I dunno) but in case it was a proactive replacement of something related to this... and because it has "heater" in the part name, I'm just wondering if this is related?? "Replace Battery Coolant Heater due to potential low isolation"